The Coopersmith 7 Piece Dining set provides a stylish place to dine with friends and family. The set includes 2 swivel chairs, 4 stationary chairs, and a slat top rectangle dining table. The table includes an umbrella hole. Chairs include a seat cushion and a lumbar pillow. Add some visual interest and comfortable seating to your home with the stylish Avery side chair. The sturdy rubber wood construction and webbing seat structure of this chair stands up to regular use with ease and the beige, 100% polyester fabric is as practical as it is eye-catching. Accented with a classic nail-head trim for durability and style, this chic chair makes an elegant complement to any dining room, living room or study. The rich beige shade of fabric is neutral enough to blend seamlessly with most color schemes, while still providing an updated take on the usual brown and black options. Relax in style and sophistication, and enjoy the outdoors with the Beacon Park 4-piece chat set. A sturdy, rust-resistant frame supports intricately woven, rich brown wicker, and features a plush olefin seat cushion and a reversible back cushion with a trellis pattern on one side, and a toffee color matching the seat cushion on the other side. Wide, curved armrests ensure maximum comfort you won't want to give up. Use as a standalone set, or include other Beacon Park furniture elements to create a complete look. Relax in style and sophistication, and enjoy the outdoors with the Beacon Park 5-Piece Patio Dining Set from Hampton Bay. A sturdy, rust-resistant frame supports intricately woven, rich brown wicker, and features a plush olefin seat and a lumbar pillow. The set includes 4 stationary chairs and a slat top rectangle dining table with an umbrella hole. Use as a standalone piece, or include other Beacon Park furniture elements to create a complete look. Relax in comfort and style with the Hampton Bay Kings Square 4-Piece Chat Set. 2 stationary chairs and a loveseat feature durable steel construction, olefin cushions in a beautiful red fabric, and decorative toss pillows. The rectangular coffee table has a lattice tabletop pattern that coordinates with the chair backs to create a uniform set. 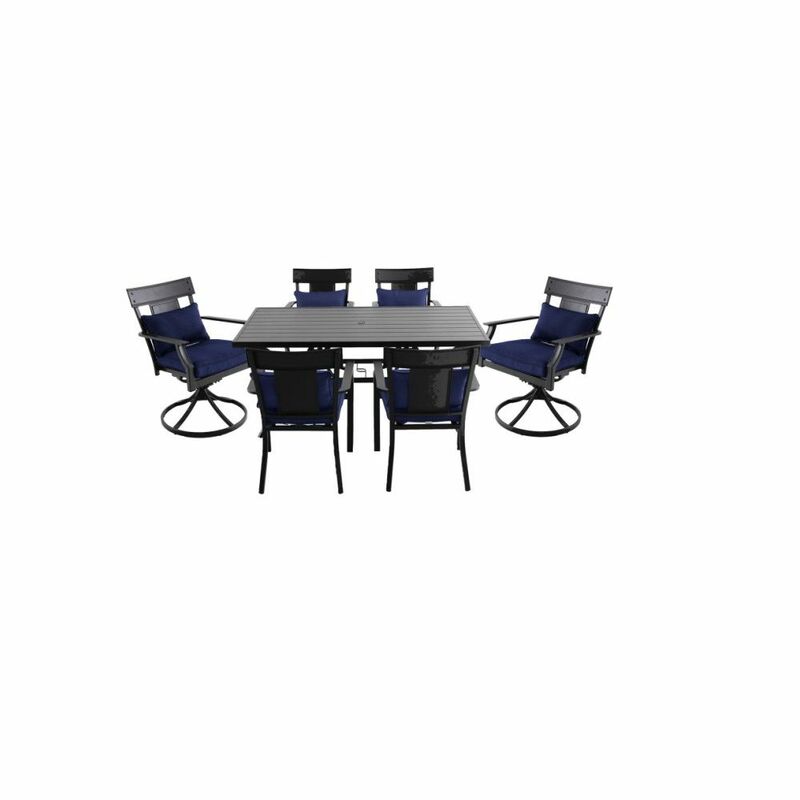 Coopersmith Steel 7 Piece Dining Set - Navy The Coopersmith 7 Piece Dining set provides a stylish place to dine with friends and family. The set includes 2 swivel chairs, 4 stationary chairs, and a slat top rectangle dining table. The table includes an umbrella hole. Chairs include a seat cushion and a lumbar pillow.